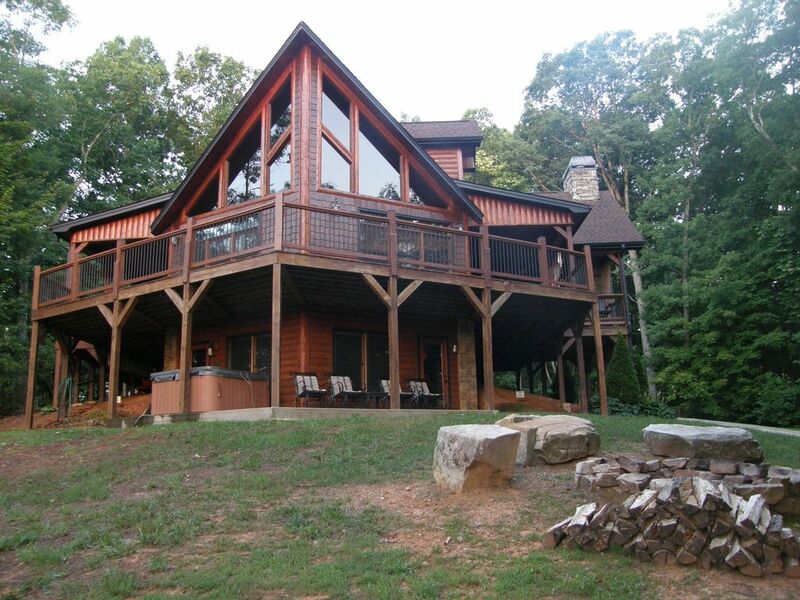 Eagles Rest is a Magnificent Large Cabin High atop Godfrey Mountain with 270 degree seasonal views of the Blue Ridge Mountains and Apple orchards below. Take in gorgeous sunrises from the wrap-around decks with an outdoor fireplace, furnished with deep seating conversation group, glider, Adirondack chairs, rockers and a picnic table. Gates on the deck protect pets and children. Indoors the cabin is beautifully furnished with antiques and special collectors' pieces. With an open floor plan guests can interact and enjoy each other while cooking, watching TV or playing games. Eagles Rest has custom millwork, knotty wood stairs and is fully loaded with first-class fixtures, furniture and electronics. Big screen LED TV's, Directv, DVR, Wi-Fi High Speed Internet. The ramp from the paved driveway leads to the deck and main floor. This level has a well equipped kitchen with granite countertops and all the small electric appliances you need for meal and drink preparation, a breakfast bar with seating for 2, dining room with seating for 8. The great room has a 55” flat screen TV, Blu-ray DVD player, stone fireplace with gas logs and windows two floors high! There is a bedroom with king size bed and a huge bathroom with laundry facilities. The upper level has a master suite with a king size bed, huge bathroom with slate shower and a jetted tub. There is a 46" Led TV and a Blu-ray DVD player in this master suite. The loft is furnished with a double bed, a trundle bed that converts to a king size bed and an overstuffed chair with ottoman. The loft is open above the great room and is a great getaway for curling up and reading a book and watching the sunrise. The lower level has a pool table, Multigame Arcade with Galaga, Shuffle Board Table, Game table with poker chips, a seating area focused around a flat screen TV, Blu-ray DVD player, and stone fireplace with gas logs and plenty of room for kids to play. There is a private six person hot tub located on the patio outside the lower level. Eagles Rest has a bolder and dry stacked stone fire-pit. Small dogs are allowed with prior approval of owner. Dogs must be on a leash when outside the cabin. Pet kennel 42x27x29 provided. This property is across the street from our other smaller cabin, Morning Glory (VRBO.com/965518). Paved roads and paved driveway to cabin, 5 minutes from downtown Historic Blue Ridge and 2 minutes from Merciers for the best fried apple pies! Eagles Rest is only a short drive from the Scenic Blue Ridge Railroad, Aska Adventure Area, Horseback Riding, Ziplines, Kayaking, Tubing, Fishing, and special event in the Park. 1996 Olympic Ocoee River White Water Rafting just 15 minutes from cabin. Antique and specialty shopping abounds. Great fun for Kids of all ages, plenty of room for grown-ups too. We purchased this home as a family vacation spot after several years of visiting Blue Ridge, Georgia. We love Blue Ridge because it is close enough to Atlanta and North East Alabama to make quick weekend trips. We love the apples, hiking, waterfalls and hope to enjoy kayaking with children and grandchildren. Eagles Rest gives you the feeling of forest living yet it is only 5 minutes from town. Dominoes will deliver and you are only 1 mile from Merciers apple orchard where you can get the best fried apple pies around. All roads are paved including the short driveway! toilet, combination tub/shower, Ground floor bath has large closet. Close to Historic Downtown Blue Ridge, GA. Check out all the activities and attractions on Fannin County Chamber of Commerce website. Spectacular Seasonal Mountain Views...see for yourself! Bath towels, hand towels and washcloths provided for use in cabin. Bring your own beach towels for tubing and whitewater rafting. (3) Directv DVR on Main floor with brand new flat screen TV. TV with Dish in basement game room, basement bedroom and upstairs master bedroom. Blue Ray DVD player on main floor and in upstairs master bedroom. Deck on three sides with two covered. One covered area has deep seating with a wood burning fireplace. One covered area near kitchen has grill and picnic table. The uncovered area has glider. Wheelchair ramp to main level! Main level includes kitchen, living and dining room, king bedroom, bath and deck with fireplace, grill and picnic table. Large hot tub overlooking mountain views. Drained and cleaned between guests. Well-Equipped Kitchen, Outdoor Wood Burning Fireplace on Deck, Wrap-Around Deck with 270 Degree Mountain View. Huge Play/Rec Room with Multigame arcade and Separate Deck, Fire Pit. Wonderful cabin with gorgeous views. Comfortable and clean with activities for everyone and a quaint area to explore all around. We will stay here again as soon as possible! One of the wonderful cabins , we ever stayed. Has everything we didn’t missed anything. Definitely we come back again. Thank you Cathy for let us use your cabin. Amazing location and this home is everything you want in a mountain trip. Looking forward to coming back!! We had 3 families stay at this amazing house. The house has lots of space and everything you need for a vacation home. The game room was used every night! The kitchen is well supplied for cooking. The property was very clean yet very cozy! It was a very short drive to Walmart, and various attractions. We had an amazing time and will definitely be back. We are thinking of making this a yearly getaway! Contact with the owners were always very quick on responses and very nice! Thank you for a great stay! Thank you for your kind words. I look forward to your annual retreat! Best view in Blue Ridge! We had a great vacation at Eagle’s Rest. The cabin was clean, inviting, comfortable, and relaxing. The beds were all comfortable and there is plenty of room for everyone. The game room is fun and the hot tub is just what you need at the end of a day full of hiking. We can’t wait to come back. Another great stay at Eagles Rest! 6 years and there’s only been improvements! Thank you for another great stay. All of the personal touches around the cabin, the cabin layout and it’s cleanliness, made rest and relaxation a guarantee. No smoking, dogs must be kept on leash when outside and poop scooped, additional charges may be applied for excessive clean-up or damage to property. Check-in is 4:00 PM Eastern and check-out is 10:00 AM Eastern.